Crispy, juicy and absolutely delicious! This traditional Greek lamb meatballs recipe (Keftedes arni) is a must try! Juicy and well seasoned ground lamb, infused with the aromas and flavors of fresh mint, garlic and oregano, garnished with cooling tzatziki sauce, served with delicious crispy and fluffy pita bread. Well, one couldn’t ask for more! Although I just love the classic Greek meatballs made with pork and beef, I think you will agree that there is nothing better than the smell and deliciousness of some fried Greek lamb meatballs. So if you like me, just love lamb, this traditional Greek lamb meatballs recipe is made just for you! Greek Meatballs is a famous Greek appetizer, commonly served as part of a meze platter. Keftedes can also be served as a filling meal with some basmati rice and a nice Greek feta salad. Leftovers (which is a good thing in this case!) can make a delicious brand new dish (click for recipe), added in a tomato-based sauce with some mashed potatoes, or pasta. 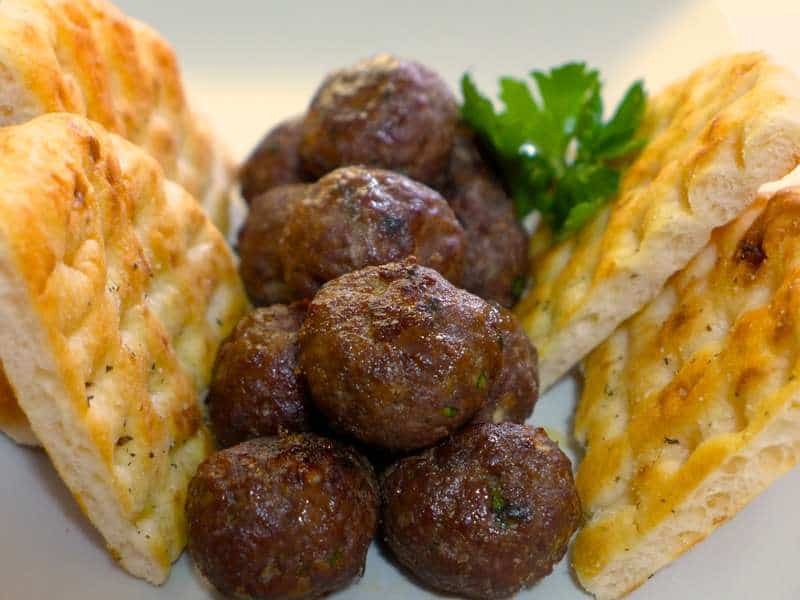 Greek Lamb Meatballs recipe – Frying or Baking? Although this Greek lamb meatballs recipe requires frying the meatballs to achieve that extra crispy texture and lots of flavor, you can also bake / grill them in the oven. The grilled version is much lighter than the fried, so you can save some calories and enjoy them guilt free! If you choose to bake your Greek lamb Meatballs, try adding some crumbled feta cheese in the mixture for that extra twist. The perfect Greek lamb meatballs always consist of a crisp exterior and juicy interior. To achieve the perfect result, fry the meatballs in a single layer in plenty of oil that just covers the meatballs. Not overcrowding the pan is vital for a delicious crispy crust to form. If you add too many of those Greek lamb meatballs in the pan, the temperature of the oil will decrease. Keeping the oil hot will crisp up the outside while keeping the inside juicy and tender. Heat the oil to medium-high heat, just before it starts smoking. To check the oil temperature, test it using a small piece of bread crust . If the oil begins to sizzle around it, creating small bubbles then you are ready to go. Turn the meatballs occasionally in the pan and adjust the heat to avoid burning until they have a formed a rich golden brown crust. So go ahead, give this traditional Greek lamb meatballs recipe a try and make your family and friends happy in less than 40 minutes! Recipe makes enough for about 40 meatballs which depending on whether you have it as a starter or main can serve anything between 5 to 10 people. 1 kg ground lamb (35 oz.). To prepare this traditional Greek lamb meatballs recipe (arnisioi keftedes), add all the ingredients into a large bowl and mix , squeezing with your hands, to allow the flavours to blend. Cover the bowl with some plastic wrap and let it rest in the fridge for at least 15 minutes. To form your Greek lamb meatballs, roll the mixture into balls, the size of a walnut. Dredge lightly each meatball in flour, until well covered. Transfer to a plate, shaking off any excess flour. The traditional way of cooking Greek lamb meatballs is frying them in plenty of oil. To fry Greek lamb meatballs use a large, deep skillet and pour in the oil to a depth of 1/2 an inch (1,5 cm). Heat the oil over medium-high heat until it begins to ripple. Add the lamb meatballs in batches in a single layer and fry for about 7 minutes, turning occasionally, until browned and crisp on all sides. Using a slotted spoon, remove the meatballs to a plate lined with paper. If you prefer a lighter version, you can bake/ grill the meatballs. Preheat the oven at 200C, place the lamb meatballs on greased baking sheet about an inch apart. Bake for about 20 minutes, turning the meatballs upside down midway through cooking time. Greek lamb meatballs are ideally served as an appetizer (meze) with some creamy tzatziki sauce and pita breads or as a main course with some basmati rice and a Greek salad. Enjoy! Lamb is the best meat for making Greek meatballs! My favorite seasonings to use are mint and oregano. During the summer months, I often omit the cumin and coriander and use more mint and oregano than what the recipe calls for.